Fig. 6 Activity chart symbols. a means of recording all the work tasks performed by a person and/or machine at a ‘work station’. Activity charts break down work tasks into five main categories: operation (altering materials, assembly, etc. ); transportation (moving materials, components or products); inspection (checking for defects); delay (hold-ups in production caused by lack of materials, machine breakdowns, etc. ); storage (items placed in stock). 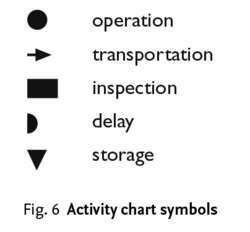 Activity charts are used in METHOD STUDY to record the methods used to perform work tasks as a basis for improving these methods by reducing delays, minimizing materials handling and combining operations. They are also used to assist in the planning of FACTORY LAYOUTS and in PRODUCTION SCHEDULING by depicting the sequence of work tasks involved. Where several machines or operatives are deployed alongside each other in a work station, multiple activity charts may be used to depict their interactions. In Statemate, a statechart corresponds to a control activity in an activity chart, just as in YSM a Mealy machine corresponds to a control process in a DFD. Typhoo has started the year with increased activity, taking third place and 14% of the top five activity chart, up four percentage points and one place from its position at the end of 2007. The Financial Services Industry continued to lead the activity chart as the sector traded 1. Pampers continues to reign supreme in the branded baby category, with a firm hold on the promotional activity chart. Dow Chemical (NYSE:DOW) finds itself lodged squarely in our unusual intra-day put activity chart, thanks to 3,503 April 50 put (DOW DJ) contracts traded. Yoplait finished last year's top five promotion activity chart in fourth place with 15% of activity, up from seventh in 2006. 50 call on our unusual intraday options activity chart with 12,000 of the bullish calls crossing the tape. Christmas promotions on booze got into full swing at the weekend as a cider brand vied with a lager and two wine brands for the top spot in the activity chart. The final brand to make it into the top five in the household activity chart was Ariel with 13% of space. Whether the final document is an ad hoc activity chart shared on an intranet web page, or a form letter mail-out, empowerment for knowledge workers is the end result. Alcohol has overtaken grocery in the promotional activity chart. Mars UK has stepped up its promotional activity in the build-up to Hallowe'en to take first place in the top five branded activity chart last weekend with a 25% share of space.